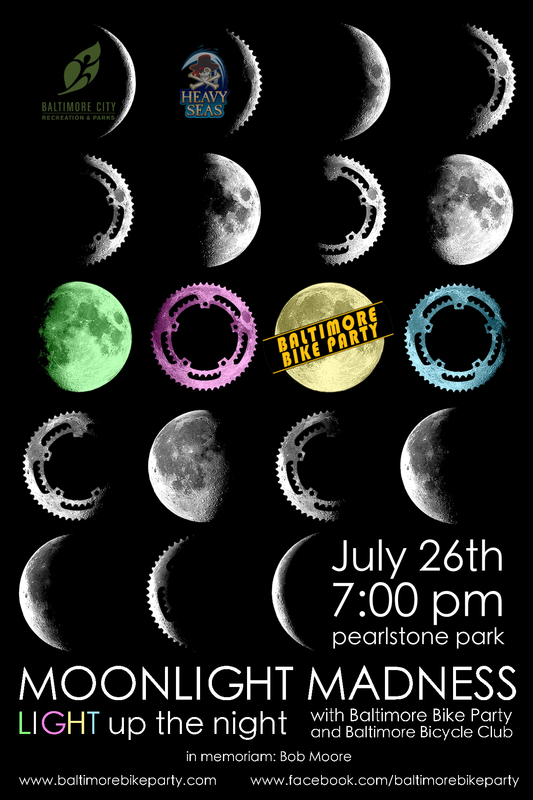 Baltimore Bike Party: Moonlight Madness! Come join us this month decked out in as many LIGHTS as you can fit on your bike and body! We want to make this whole city glow!! Moonlight Madness was originally an annual ride started by Bob Moore, who was instrumental in bring trails, bike lanes, and safe legislation to Baltimore. Sadly, Bob has passed but with help of Baltimore Bicycle Club and Bike Party’s adoption, the ride has lived on and is bigger than ever! Spread smiles, cheers, laughs, and high fives, just the way it should be, as we ride through the streets of our awesome city and finish in Wyman Park Dell for another great after party! Expect food trucks, Heavy Seas ales, DJ Ro, and maybe some other surprises! if you are new to Bike Party, be sure to check out the info on our website to know what to expect and how to prepare! meet at Pearlstone Park at 7pm, roll out at 7:30 sharp!